Myrons favorite two stroke oil. For premix or injector. Two Strokes: Most older mopeds and motorized bicycles are two stroke engines that do not have motor oil in the crankcase. Instead the crankcase has a mist of gasoline with 2% or 4% two stroke oil blended in. The crankshaft and piston are lubricated by the gasoline mix. Two stroke oil is designed to be stable when mixed in gasoline, and to burn clean and not make black tar and carbon build up. Regular motor oil will work in a two stroke, but will leave a mess of tar in the engine and or gas tank. 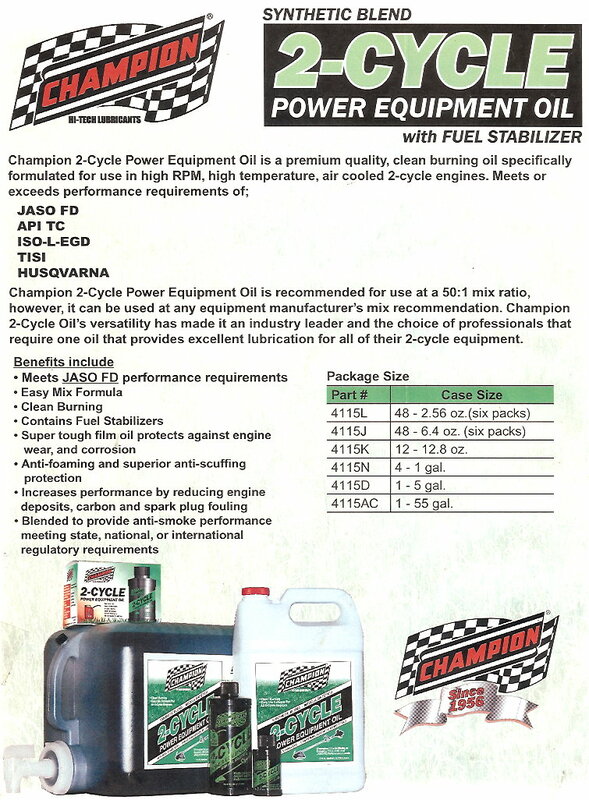 Champion Synthetic Blend 2-Cycle Power Equipment Oil, with fuel stabilizer, is the two stroke oil that Myrons Mopeds recommends. It is a premium quality ashless motor oil for use in 2-cycle air cooled engines (with higher temperature demands). It combines Group II base oils and pure isobutene, rather than commonly used fragmented isobutene which can degrade faster at high temperatures. In addition, it contains several semi-synthetic additives providing excellent detergency and a dispersant to provide protection and performance. Super tough film, anti-foaming, anti-scuffing, fuel stabilizer, all beneficial. In a two stroke (2 cycle) engine, separate from the crankcase is the transmission case, which does have a pool of motor oil or automatic transmission fluid in it. The transmission oil or fluid needs changing every 2000 miles. Below is a chart showing what oil goes in what moped engine, and where to add it and check the level. Four Strokes: Most newer mopeds and scooters are four stroke engines, like cars, with motor oil in the crankcase. The oil for those is the same as for cars, such as 10-40W. Four stroke oil is motor oil. But unlike cars, the transmission shares the engine oil, like most motorcycles. Motorcycle (non catalytic exhaust) motor oils contain ingredients that are beneficial, but harm the catalytic converter. Motorcycles, scooters, 4-stroke mopeds with catalytic converters should use ordinary car motor oil. Type A versus Type F: Type A up till the 1970’s contained whale oil as a friction modifier. A modern friction modifier/reducer is glycerol mono-oleate. Type F contains no friction modifiers. Modern vehicles have nine current ATF versions: ATF+4, Mercon V, Mercon LV, Dextron VI, ATF DW-1, SP-III, Matic-S, Toyota ATF-WS, Honda DW (ZF). Any of these will work in a moped transmission. They are only slightly different. ATF Mercon V would be the safest to use, since it does not have friction modifiers. Friction modifiers are better for the gears and bearings, to reduce friction and extend life, because part of the molecule clings to metal and part is a long chain that slides over metal easily. What’s good for the metal parts may or may not be good for the clutch. This is a current area of investigation. Detergent versus Non detergent: Motor oils come with a detergent additive that keeps the dirt floating in the oil, so it can be removed by the oil filter. Non detergent motor oils allow the microscopic dirt particles to settle out. They are for engines and machinery that do not use oil filters but instead rely on manually removing the sludge from the bottom of the oil bath, as in machine shop equipment and small gasoline engines. Some rubber parts can get damaged from the detergent in the motor oil, in particular the Garelli 1-speed and 2-speed centrifugal solid rubber clutches. 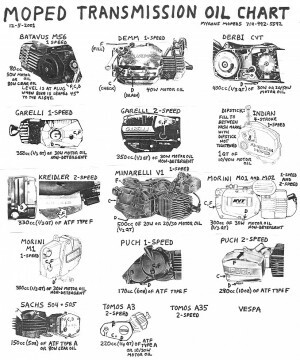 Garelli, Morini MO-1 and MO-2 call for 30W non detergent (ND), while Batavus/Trac, Demm, Derbi, Indian, Minarelli, Morini M-1 call for motor oil 30W, 40W or 10W40. See above chart. You are currently browsing the archives for the All About Oils category.